We caught the overnight crossing from Portsmouth to Le Havre which docked at 8am. 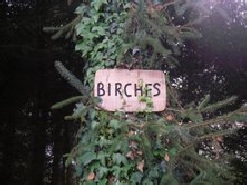 The drive from Le Havre to Blavet Valley Lakes is 250 miles. The French roads are very good and we didn't get stuck in any traffic at all. Fortunately we had a Tom Tom Sat Nav system with a French map which meant the end bit of finding the lake was a lot easier than had we been stuck with the old fashioned map! We arrived at the lakes at lunchtime and were shown around the lake by Berny and her son, Ross. 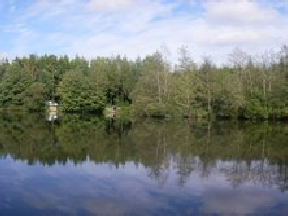 The 8 acre lake is situated within 24 acres of woodland in the Blavet Valley which provides a very peaceful (and at night silent) environment to fish in. 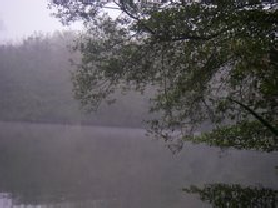 The lake was originally excavated for sand and gravel in the 1960s and has depths ranging between 6-12 foot. The majority of the lake bed is gravel and we found no weed at all during our trip. A lot of the fishing is done in the margins which are well protected by over hanging trees, although snags are rare as a lot of underwater pruning has taken place. A bait boat can be very handy to deliver baits under the trees. There are trees that overhang by 20 foot and it is impossible to cast under them so a bait boat can be very useful. Bait boats are available for rent at a cost of 10 Euros per day. We had both taken some bait with us including Quest Special Crab and the DSM Boilies from Bang On Baits. Chris Nicholls had also brought a good amount of hemp and between us we had enough groundbait to fill in a lake! 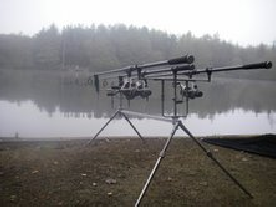 The boilie of choice at Blavet Valley is Mainline Grange in Pineapple, Mediteranean Shellfish and CSL, and these are available at a very reasonable price at the fishery. A particle mix and pellets are also available at reasonable prices, but you are advised to use this sparingly by the fishery. We set up on the first day primarily fishing single hookbaits over a small patch of groundbait. 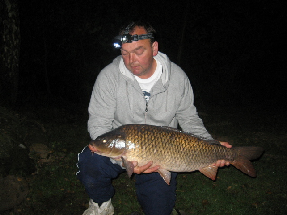 The first evening saw Chris Nicholls land a good sized bream along with a nice common at 23lb. We hoped that this was a sign of things to come. Unfortunately the fishing slowed right down and it was not until Thursday that our second carp was taken - Chris Nicholls performing the honours again. With 6 rods between us we covered every possible combination of presentation including zig rigs, pop ups, snowmen, single boilies, double boilies, maize, tiger nuts, peanuts and every other possible assortment! We persevered with the small areas of bait as suggested by Berny and Gordon but this didn't work for us. As the week went on there was an increased temptation to pile the bait in to try and buy a few takes. We did bait up a few areas but this didn't work - the fish simply weren't feeding. We spent a lot of the time fishing the margins, but in the middle of the lake is a set of markers which are used primarily to split the lake in half to ensure that lines don't get cast too far in to other anglers' swims. 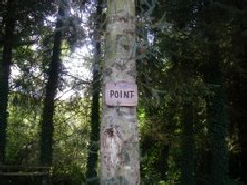 The markers provide another mark to fish to and are a popular choice. 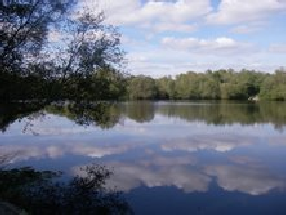 Mirrors to 53lbs and Commons to 38lbs have been stocked in the lake and in February 2007 a x 50lb and 6 x 40lb fish were stocked along with 12 x 30lb fish. 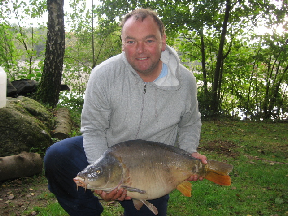 Over the coming winter two more 50lb carp will be added along with another ten forties. More thirties will also be added to boost stocks. 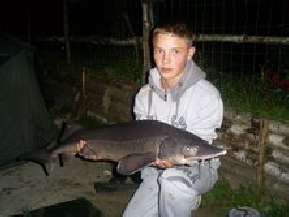 There are no Catfish or Crayfish in the lake although there is one Sturgeon that was caught twice during our visit. It can make a nice change from catching carp....! Of the people that we met on the lake, they were all returning customers, and all were more than happy with the prospect of being well fed by Berny and Gordon all week. The package includes two meals per day - breakfast and dinner, although lunch and a late night snack can be ordered as well if required. We found that the two meals provided were more than filling. Breakfast is at 10am and consists of a full English breakfast - a great start to the day which will keep you going until dinner at 6pm. The dinners are excellent and Gordon excels himself in the kitchen. All meals are prepared through the day and the home cooking is well appreciated by the anglers. There is more than enough to go round and the desserts finish each meal off nicely. 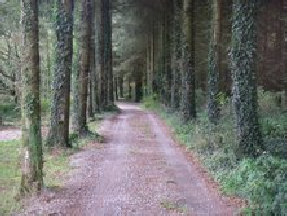 The lake is well kept and there is a track around the lake which enables you to drive to your peg - a welcome addition when you have packed enough gear to last a week. Some of the swims also have a parking space between them. There are no security issues on the lake but it can be handy to have the car near the swim. The swims are all named, each with a nicely made plaque on the tree. A variety of options are available for anglers to bring their family regardless of whether or not they fish. Under 16s are only £100 for the week, udner 10s are £50 and under 5s are free. 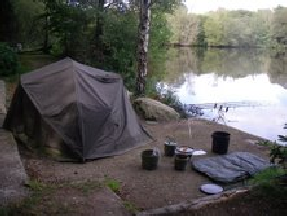 Accomodation is also available for non anglers for £150 per week in the modern mobile home on the grounds. Berny and Gordon also offer an airport pickup service and they have full sets of tackle to hire as well. The hire gear that we saw was good quality and reasonably priced. It certainly would be an option to consider if you would prefer to fly. Despite the poor catches during the week we were there, we saw enough fish showing themselves and were impressed with the hospitality and the lake in general that we will almost certainly be back. A very scenic and beautiful location There will be a fish or two under the trees! Following our return to the UK I have read reports of other lakes having poor catch results during the week we fished and one quoted it as their worst year in 4 years. Perhaps it wasn't just our fault! Cost: £300 per week (including 2 meals per day). Non anglers £150 and other concessions available.